Our trap muscles gives our shoulders that enviable, broad, V-tapered look that bodybuilders are typically associated with — yet many people are still confused about how to properly train them. That’s because trap muscles are actually three minor muscle groups; the lower, middle and upper trapezius muscles. The lower and middle muscles are used for activities such as rowing, while the upper muscles are required for movements, like shrugging your shoulders. Trapezius muscle workouts help develop and strengthen all three muscle areas, which can improve your posture and reduce your risk of neck, back and shoulder injuries. Your trapezius muscles are some of the first to bother you when you are under stress, which is why it’s important to keep them strong and supple. If you’re wondering how to work your traps for that well-defined toned look, consider incorporating the following exercises into your shoulder and back workouts. Before performing each exercise warm up your muscles adequately. Muscles that are not warm are likely to pull or strain easily during the trapezius muscle workout. Perform 8 to 12 repetitions of each exercise, for three sets each, before moving on to the next move. For this exercise you will need a barbell. Grip the barbell, keeping your hands at shoulder width distance from one another. Maintain a straight posture, and keep your feet shoulder width apart. The barbell should be positioned at an arm’s length from your body. 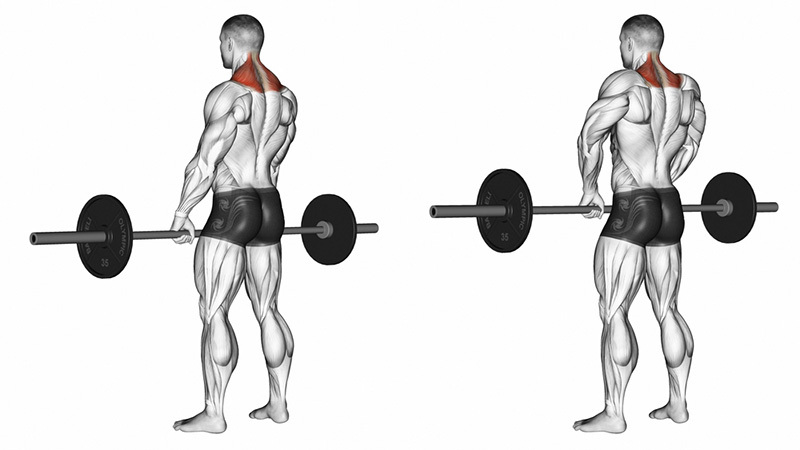 The basic movement is the shrugging of the shoulders, so this exercise is quite simple. Simply push the shoulders downwards until you can feel the stretch in your muscles. Hold this position for a few seconds. Then push the shoulders upwards until you can feel the squeeze in your trapezius muscles. Hold this position for a few seconds and repeat the entire sequence again. 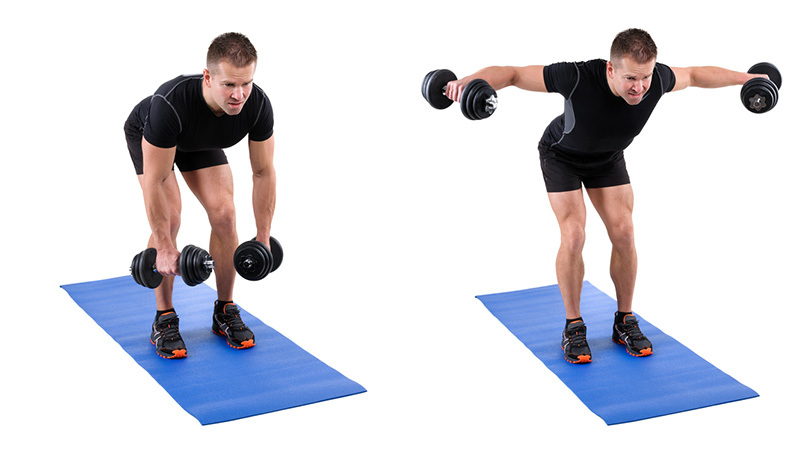 For this exercise you will need to hold two light dumbbells, one in each hand. Stand with your feet shoulder-width apart. Do not straighten your legs completely, as this will strain your back (don’t lock your knees). Extend your arms towards the floor, in such a way that the dumbbells are facing each other. Keep your elbows slightly bent as straightening the arms completely will cause unnecessary bodily strain. Then gradually push the dumbbells upwards, raising them to form a semicircular arc. When you cannot raise the dumbbells any higher, hold the position for a second and then slowly lower the dumbbells back to their starting position. Repeat the entire sequence. For this exercise you will need a barbell. Grip the barbell, placing your hands slightly less than shoulder’s width apart. Maintain a straight posture, and keep your feet shoulder width apart. The barbell should be positioned at an arm’s length from your body. Raise the barbell upwards, and stop when the barbell is right below the chin. Remember that your elbows must be above your hands at all times! Hold the pose for a second, lower the barbell back to the initial position and repeat the sequence. For this exercise you will need a standing calf raise machine. Position yourself on the calf raise machine as you would if you were preparing to do a series of calf raises. Make sure that your legs are straight, and push you shoulders down. Hold the position for a second, then push the shoulders upwards and hold the position for a second. Repeat the entire sequence.